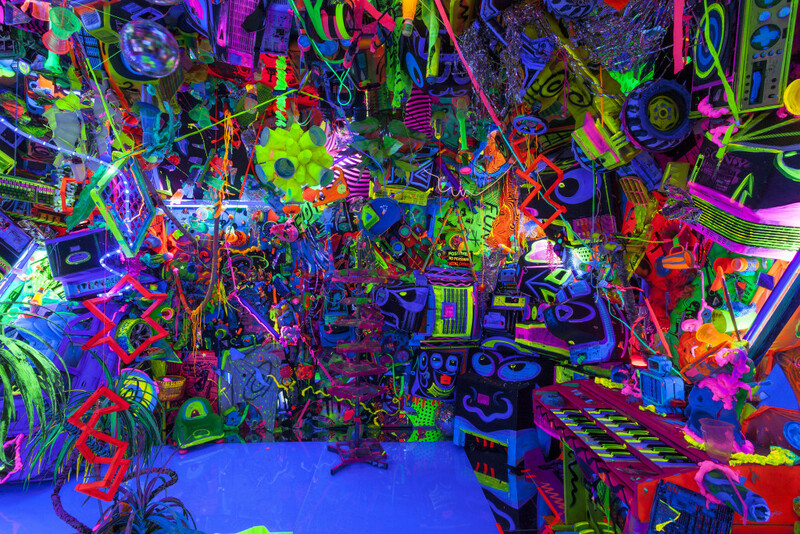 Kenny Scharf’s Cosmic Cavern immerses viewers in a day-glo universe densely packed with graffiti tags, detritus, and everyday objects reimagined as cartoon personalities. This surreal world comes to life under the fluorescent black lighting reminiscent of clubs and discos of the 1980s, a central inspiration for this party environment turned art installation. In 1981 Scharf created the first version in the closet of the small New York apartment he shared with artist Keith Haring. 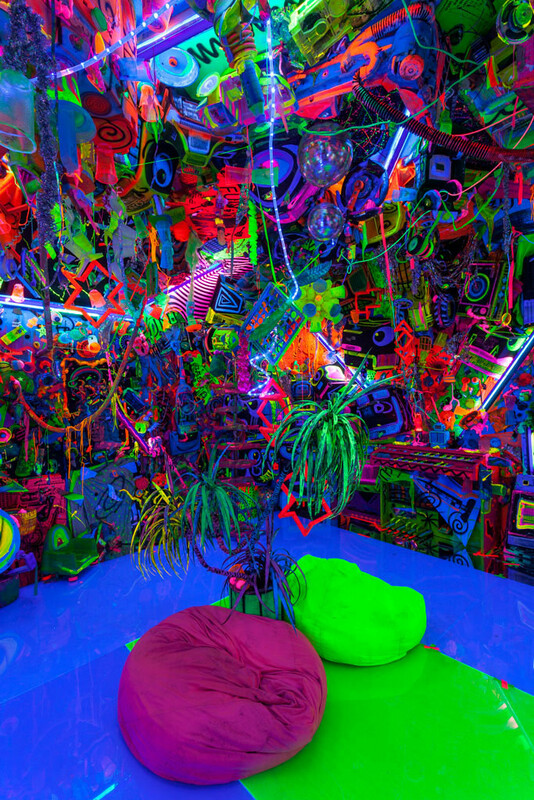 Since then, he has transformed basements, galleries, museums, RVs, and even suitcases into this psychedelic, multi-sensory experience. Scharf was among the tight circle of artists that included Paige Powell, the photographer and video artist whose multimedia installation Paige Powell: The Ride (also opening November 5) immerses Museum visitors in that creative climate. Powell and Scharf’s friendship continued after both departed New York in the 1990s. In Portland, Powell played a key role in advocating for the installation of the Tikitotmoniki Totems—the 2001 public art work Scharf designed for Jamison Square in the city’s Pearl District. Together The Ride and Cosmic Cavern offer museumgoers two distinctive visions of the groundbreaking art scene of 1980s New York. Both demonstrate how highbrow and lowbrow, street art and gallery art, music, fashion, and publishing collided in ways that paved the way for the hybrid forms of artistic expression and creative entrepreneurship we so highly value today. Presented by Portland Art Museum courtesy of the artist and Honor Fraser Gallery. Curated by Sara Krajewski, The Robert and Mercedes Eichholz Curator of Modern and Contemporary Art. Supported in part by Ed Cauduro Fund of The Oregon Community Foundation, Jean M. Coleman, Frank Etxaniz, Henry Lea Hillman, Jr. Foundation, Susan Hoffman, Thomas Lauderdale, Paula Madden, and Al Solheim.